In 2013, Casey Jenkins sent the internet into a fury with her performance art piece title Casting Off My Womb, which quickly became known as Vaginal Knitting when video of her art piece hit Youtube. The piece was met with praise, criticism, and a whole lot of angry, cruel comments. There were thousands and thousands of comments, which were largely negative but also highly repetitive. Instead of getting upset, Casey was intrigued by the comments and their repetitive nature. She began screenshotting the thousands of comments and sorting them into files with labels like “Gross/Disgusting”, “Physical Criticism” and “Assorted Threats of Violence”. 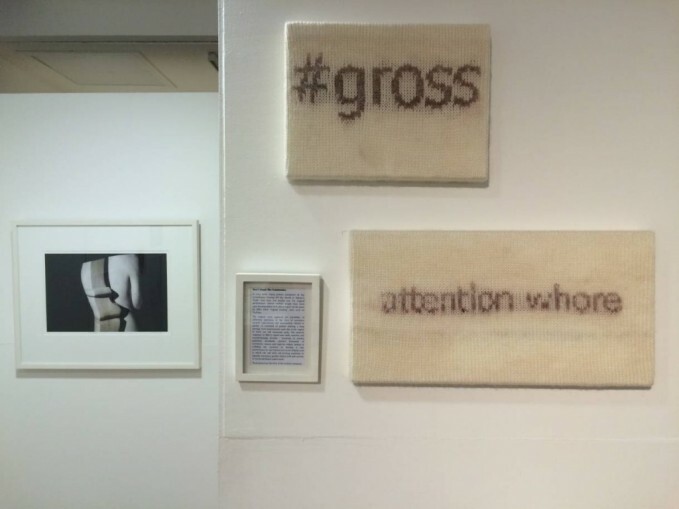 Casey decided to start working with a digital knitting machine, to emulate the robotic nature of the comments, to knit some of the most common comments out of wool dyed with her menstrual blood. But this time it’s not just about her, she wants her vaginal knitting projects to help internet trolls reflect on their harassing behavior. She has titled this project Programmed to Reproduce and some of her pieces are already on display at a Melbourne, Australia art gallery.